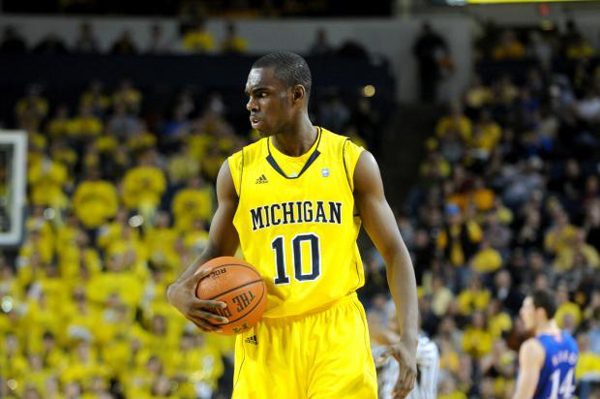 Burgeoning Wolverine Star: A note on Tim Hardaway Jr. I've drawn much ire for my criticism of Tim Hardaway Jr. in the wake of the Michigan State game. Because I don't like being wrong, and more importantly, because I want to affirm that what I'm seeing and thinking are not totally crazy, I figured I'd jot down some thoughts about Michigan's most enigmatic scorer. Hardaway came out of high school as a middling three-star recruit (Scout listed him as the #36 shooting guard in the country; he wasn't ranked on Rivals). After a successful freshman year, people were crowning him as one of the league's best scorers, which he might well be, but in a way that should make more people skeptical of his production. Hardaway is a high-volume shooter (he averaged 13.9 PPG on 10.8 shots/game last year; 15.4 PPG on 12.5 shots/game this season), which is odd given his predilection to disappear for large periods of time. Unfortunately, this equates to a player who is not particularly efficient on the offensive end. For those of you unfamiliar with PER, it stands for player efficiency rating. This is the catch-all metric I developed to sum up what you see in the box score -- a method I developed to provide apples-to-apples comparisons of NBA players who are playing under different circumstances. It doesn't see everything because not everything is counted -- for instance, the box score doesn't have good defensive stats besides blocks and steals. But it's adjusted for the pace of the game and calculated on a per-minute basis, so it's a great way to get a statistical snapshot of a player's efficiency and effectiveness. PER is, in my opinion, the best metric for judging players. When the initial college rankings came out a week or so ago, I wanted to see where Hardaway landed. Given his production and widespread praise, I sort of assumed that he'd end up in the good-not-great region of players nationally. But a glance at the top 100 players nationally in PER returns no Wolverines. Fortunately, Hollinger also has a conference-by-conference breakdown of players. Hardaway? 36th... in the Big Ten. Hardaway's PER is a middling 18.53 (per Hollinger, league average is 15.00). Both Evan Smotrycz (20.15, 25th) and Trey Burke (19.71, 27th) rank higher than Hardaway. For perspective, Jared Sullinger is currently leading the Big Ten in PER with 33.18. PER is a metric that can swing a few tenths of a point after a single game, but after tracking Hardaway since the rankings have been up, he's been consistently in the high teens, and has not surpassed Smotrycz or Burke. Less objectively, Hardaway seems to be a player that gets praised for good timing and image. Hardaway has come up big late in games, and he may very well be one of those clutch scorers that just happens to put it together at the end, but that's not the kind of top scorer you can successfully build your team around. There's a reason Hardaway doesn't get to the line or the bucket: he can't, really. His first step is slow, his lateral quickness is lacking (just look at his defense, about which more later), and he doesn't have the strength to muscle up inside. He does, however, have incredibly long strides that make him an excellent transition scorer and afford good straight-line speed. But Hardaway is not a bad player. Hardaway is a great player to have as a second or third option, which he ostensibly is given the success of Burke and Darius Morris last year. The problem is that Michigan's second option offensively is a defensive sieve. Hardaway's PER benefits from the lack of defensive metrics because, as most can agree, he's either a lackadaisical defender (not rotating to help, getting lost in coverage, taking possessions off) or outright subpar. I think it's a combination of the two: his lateral quickness hinders his ability to guard athletic shooting guards and small forwards, and he fails to make up for it with Zack Novak effort. I do really like Hardaway. He seems like a good kid with the raw talent to be a special player, but I also think he gets too much praise for his actual output. You'll think I'm crazy or a prick for writing this, but you probably thought that already. At least now I know I'm not crazy. I don't disagree that Hardaway is an erratic player that has some defensive liabilities. As lame as "clutch" comes off, it does seem to apply to him though (see @PSU last year, Illinois in the BTT, MSU at home last year and this year). My biggest complaint with your "Arrival" posting was calling him a malcontent with seemingly no backup for what comes off as a personal attack. Couldn't agree more with your analysis. One thing that I have noticed, and it drives my insane, about THJ is that he is always late getting to the perimeter. I can't tell you how many times I've seen him attempt to run out to someone taking a three point shot and he either hesitates or just seems to be going at 75%. Which typically results in a made three point shot, since the shooter has a wide open shot.